Our users often ask us how Woodpecker sends emails. That's an important question because your success depends on the way your cold emails appear in the main folder of your addressee's inbox. We believe that the solutions we have designed are crucial in cold email delivery. We have created them as tools you can use to achieve maximum deliverability and visibility of your messages. Understanding how cold emails need to be delivered will give you proper control over your campaigns. Your emails will be sent right on the schedule and the good timing will increase your deliverability, visibility and in turn, your reply rates. We also wrote a blog post on that topic. You can read it here How Your Emails & Followups Will be Sent by Woodpecker. 1) Woodpecker acts like a user of your email address. Woodpecker sends emails directly from your mailbox. Most email providers will show you messages sent by Woodpecker in your "Sent" box. For that reason, Woodpecker can send emails according to the rules set up by your email provider. You should know how many emails your provider allows you to send per day. You should also be aware of what content your email provider considers to be spam so that your outgoing messages do not trigger the safety mechanisms for outgoing emails. If you exceed the sending limits (eg. 500 emails for free Gmail accounts) or send emails containing spam words your email provider will send us a server notification that your mailbox was suspended (usually for 24 hours). In such a case, Woodpecker will show an error on campaign list. Woodpecker sends messages using your email SMTP address. Our server IPs are used to initiate the sending, and your provider's IPs are used to actually send the emails. That means your messages appear as if they were sent manually. 2) Woodpecker throttles and randomises sending from your email address. People are rarely able to send an email more frequently than every 45 seconds. Sending multiple emails in a short time and divided by even time intervals might alarm SPAM-filters. Those filters are sensitive to such regularities. For that reason, we have designed Woodpecker to imitate human behaviour in terms of sending emails. By default, Woodpecker will send your messages divided by random time intervals, yet no more frequently than every 60 to 120 seconds. That means you are able to send between 30 and 50 emails per hour from a chosen email address (additional seconds are used for procedures like checking the validity of an email address). We generally do not recommend lowering those default settings. This setting is separate for each email address, though. If several campaigns are set to go out from one address simultaneously, the emails from all those campaigns will be sent from your mailbox in an interweaving way. All the emails planned to be sent at the time will be put into the single queue, with the follow-ups having priority over Emails #1. If you want to prioritise one of your campaigns, pause all the remaining ones to be sure the messages get into your prospects inboxes on time. 3) Decide how many prospects will get your email each day. In the campaign editor right next to the text editor, you will be able to set the "Daily limit". With this function, you can choose how many prospects will receive the first email in the sequence every day (according to your schedule). You can send your emails according to the idea of Aaron Ross's Predictable Revenue. For example 50 per day, Mon-Fri.
4) Set your emails to be delivered at a specific time and get to your prospects' inbox right when they'rechecking the email. It's good to schedule your emails to be delivered within some specified time window, for example between 9 AM, and 1 PM. To give you this possibility, we have created a function to select hours and days when each part of the sequence will be sent. You can also set the time zone specific to your target group. While adding a follow-up to the sequence, the settings will get copied from the settings for the previous message. From the second email in the sequence onward, the "Daily limit" window will be replaced by the "Follow-up" window. You can specify the number of days after which another email will be sent. The minimum value here is 1. One day is exactly 24 hours, two days are 48 hours and so on. If your previous email was released on 2:34 PM, and you set your first follow-up to be sent after 1 day, the next email to this particular prospect will queue to get sent after 2:34 PM of the next day. Sending follow-ups is not affected by the daily limit, but scheduled follow-ups have priority over initial emails and you should consider this when setting delivery times. In sum, these settings give you control over the way your emails are being sent. You can control how many emails per hour will be sent, on what days and after how many days the prospect will get a follow-up. Having all these variables combined, you can create various campaigns fitting your needs. 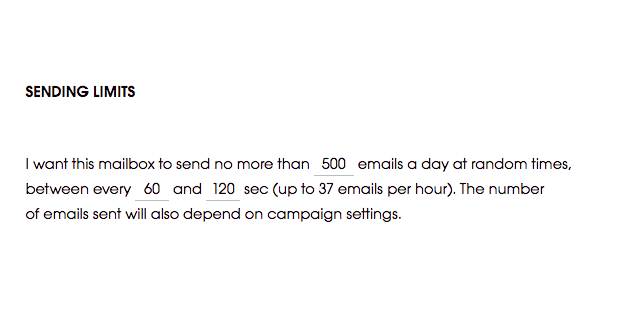 This is an example of a campaign set to send 50 emails in the two-hour time window between 9:00 and 11:00 AM before a lunch break. The copy is short and I'm asking if the person is available to chat now (and I'm ready to call/chat in 3 minutes after receiving a reply ). This is an example of a highly targeted small campaign set to send messages early in the morning when your prospect is checking the email on their smartphone. The time window is really narrow and snippet research takes some time but good cold email is all about quality. To either disable or enable open rate counter please switch off/on Open tracking in the Campaign editor. This article about open rates explains how the tracking works. 3. Why can you sometimes see delays while sending your campaigns? Woodpecker prioritises Follow-ups over Emails #1 (this is a default, you can't change that). You want to send 150 follow-ups and 50 Emails #1 from a single email address. That's 200 emails in total. "Sending" settings are set to send 40 emails per hour. Your "Delivery Time" settings for each campaign are set to deliver emails in a 3-hour time window from 12 PM to 3 PM on Mondays only. In this example, Woodpecker will be able to send 120 from the planned 200 emails. Woodpecker will send 120 prioritised follow-ups on Monday and the rest 30 follow-ups along with the 50 Emails #1 will be postponed to be sent a week later. Your email provider has a daily limit of 500 emails per day per email address. You want to send 300 Emails #1 from a single email address. For five days. That's 1500 emails in total. You have set up follow-ups to be sent 3 days after the initial email. Your "Delivery Time" settings for each campaign are set to deliver emails for 24 hours from 12 AM to 12 AM. In the third day, Woodpecker will try to send around 300 follow-ups + additional 300 Emails #1. 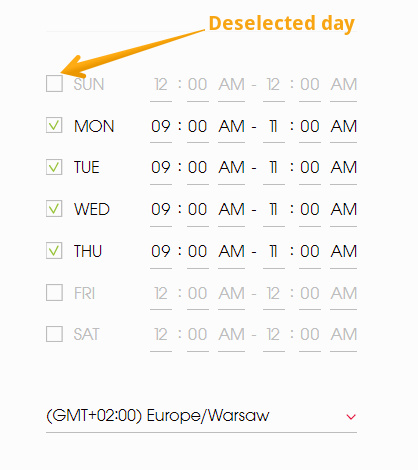 Since your Delivery Time settings are not limited to send 500 Emails per day (24 x 40 = 960 not 500). In this situation, Woodpecker will attempt to send 600 emails. At 500th Email your Email provider will block your email address for 24 hours for "exceeding sender quota". That's why it's important to assess how much time your emails will need to get sent and adjust the settings to your goals across all campaigns. Too narrow settings will be bottleneck and delay will happen. If the settings are too wide, you will be blocked by your email provider for exceeding sender quota. Your campaign is running, all settings are correct but no emails are being sent? Have a look here!